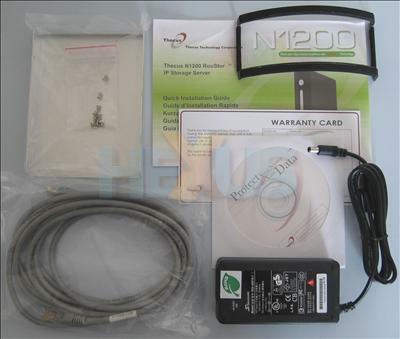 All N1200 users know that the disk inside runs on the hot side. The fan is more or less useless, because it's so small. In fairness, other NAS devices are just as hot. 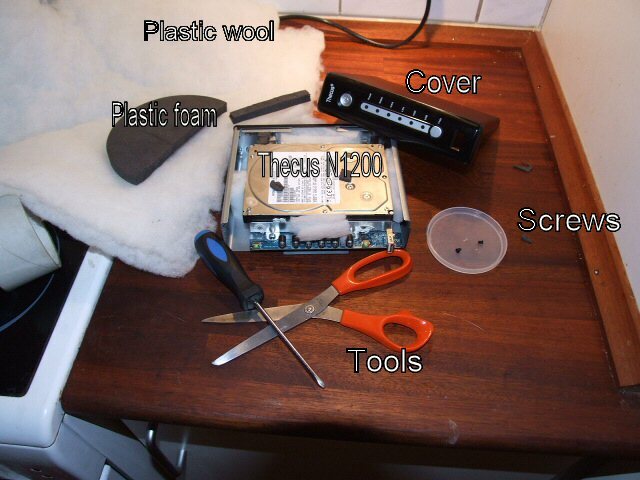 However, I reckon the design of the N1200 has scope for improvement with a simple modification. 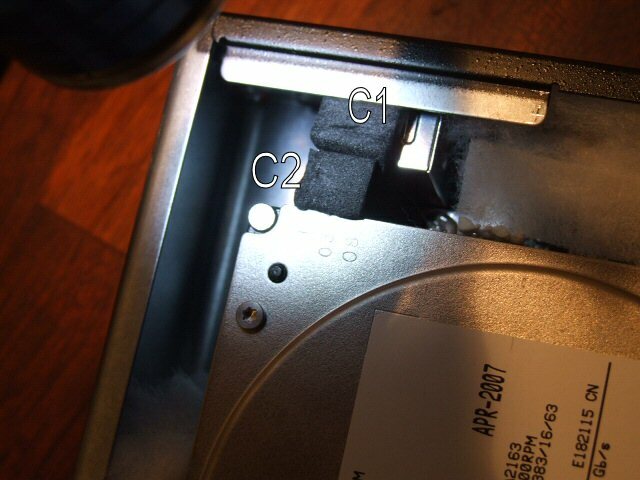 The removable metal casing of the N1200 comes very close to the top of a 3.5" hard drive. I reckon a thermal pad of some sort between the two would help conduct more heat away from the disk (and motherboard) and into the casing. Question is... what product to use? It can't too adhesive on the disk-facing side, because removing the casing will ruin it. I think you are right in that a much larger surface area is needed to remove the heat from the drive. Perhaps simply adding some passive cooling would help - something like www.quietpc.com/gb-en-gbp/products/harddrivesolutions/x-hdd-heatpipe if it would fit ! The thing in the bag, top left. I have done some hard work to make my N1200 cool and quiet. I have some pictures and a long explanation, so let´s start at why. Looking inside N120 i noticed that the air had many ways to go that didn't do much for cooling the print and the HD. After some experiments i came up with this solution. I managed to get the temperature down to under 40 C./ca. 110 F? after streaming music for 15 min. and got the noise level even lower than it was. The Fan control is now lowering the speed most of the time. Here is what is needed to do the modifications. The white stuff is a kind of plastic wool used in speakers for dampning resonans, and its called acoustilux. Cotten wool can be used but has a tendency to give off hair(dust). Don´t use Rockwool of any kind! The plastic foam can be any kind you can find like, polystyrene. I just found this in a box along some forgotten hardware. Keep clear of the fan, we don´t want anything stopping it. Cut a piece of wool, the size of a normal index finger and put it gently where shown. It has to be fluffy to work proberly. There is no parts here needing cooling, but it´s a space for resonances. Cut 2 foam pieces that fit tightly i the L-shaped space here behind the 1GB network connection. Remember to fill out the space under the metal edge. We want to close this hole in order to force air to go under the print and HD. This will cut off a waste of air from the fan. Cut a piece of wool 4x5 cm. and roll it to a 4 cm high cylinder. Put it as in the picture and take care not to cover any of the ventilation holes. This is needed to direct the airflow all the way from corner to the other corner and it will also dampen resonances in the "big" space between C and D.
Cut wool in a 4x5 cm piece an stuff it down behind the LED´s. When we close up it will prevent air flow around the LED´s where air is wasted. Cut a 2x10 cm. piece of wool and and fill the gap above the HD connection. First of all it prevents resonances here and helps E to stop the air. This shows the small pieces of rubber around the screws and between HD and cabinet. This stops vibration from getting tranfered from the HD to the box. If you want to prevent the cover from shaking even a little bit, put some small pieces of foam on top of the HD, ½x1x1 cm and fix them with double adhesive tape. Now put on the cover and hope that I´m right and nothing bad happens. I have tested this for a day, but you never can tell and I can´t give any garranties. If you try this, you do it at your own risk. And remember to take all the strange stuff away if you need repair. What was your temperature before the mod? I didn´t take the temperature before, but I guess it was around 45 C.
If you have an unmodified N1200, please take the temp and tell us what it is. I opend the box to try to turn the fan aruond, then I saw all the resonance-spaces inside and as I fiddled around with it, the airflow ideas came to my mind. I didn´t plan to go public before I saw the result. By the way, the fan is still blowing down. It blows the dust away, and wery little dust is at the top, so this way it keeps itself cleaner inside, than if you turned the fan upside down. I have the same 320GB HD as yours. It died after 9 days inside my N1200. Right before it dies, I plugged a USB HD to the N1200, and tried the "USBCOPY" function. Maybe the global warming plus hot weather of Hong Kong, anyway I gave up to put a 3.5" inside N1200. Besides, a HK computer magazine ranked N1200 is the worst NAS with high HD surface temp at a publication. After the replacement, I put this 320GB at the eSATA port and spin it down for 20min idle time. 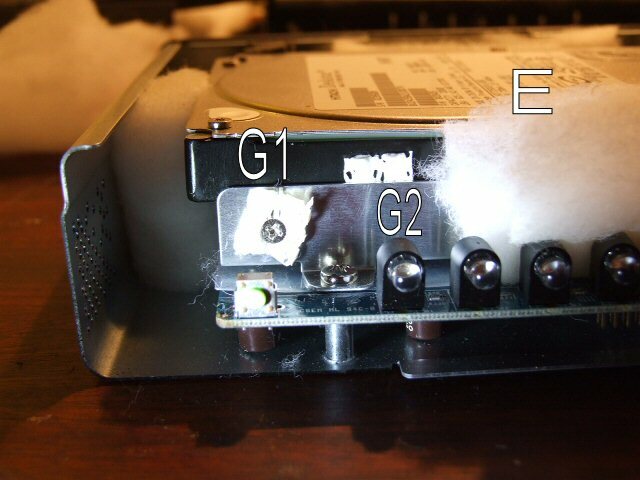 Only at eSATA, SATA port cannot be spinned down. A 2.5" 40GB HD is inside my N1200 now. Works OK, but the fan will get noisy for every 4~5 days. As far as I remember chips die at 60 C, so 40 C is not a bad result after all. Chips don't die at 60ºC. I'm not sure where you've got that from. Perhaps you've read that as the thermal limit of a CPU somewhere. In which case, that limit is the temperature at which the glue bonding the chip to the package softens and the die can potentially move. In other ICs, things just start burning up as they get hotter. But the maximum operating temperature differs from chip to chip. As for hard drives, well the cooler they are the better. But what you really don't want to do to a mechanical device is put it through cool->warm->cool too often. Expansion and contraction is bad for the precision mechanics in a hard drive. Deskstar drives in the past (IBM era) were notoriously unreliable. Perhaps they're better now. With regards to the "wool mod" I can't see how that's helping. You're restricting airflow (OK, maybe channelling it) but not providing any extra means of conducting heat away from the drive. 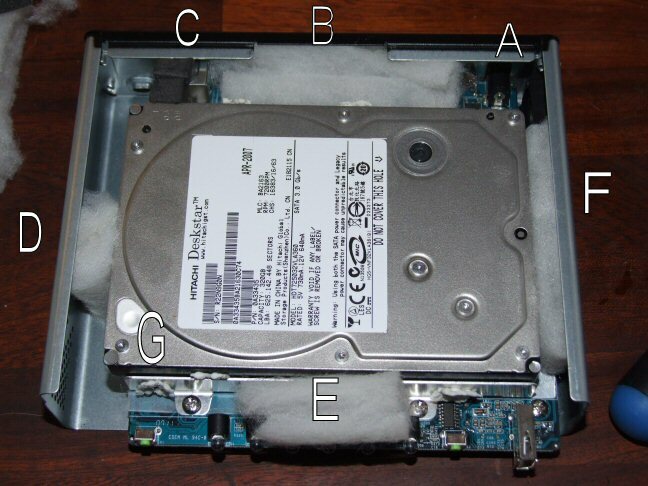 My advice would be get the disk in contact with the casing over as big an area as possible. The plate Thecus provides does the job for me. I have my N1200 on 24/7 with a Seagate ST3500630AS installed. This was the highest setting for an alarm on one of my motherboards telling me the CPU was getting to hot. It is not an absolute value representing all chips now and in the future. I use this as a quallified guess. 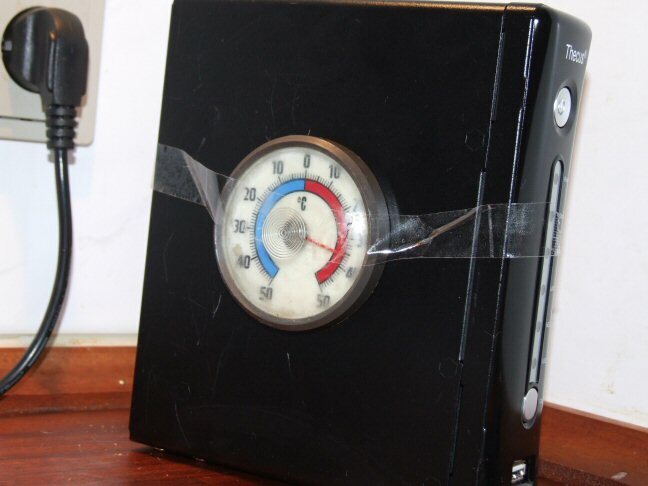 If this modification makes the temperature stay withinn a range where the fan control changes the speed, you have an active mecanism trying to hold the temperature at the same level. I can hear it working. Before the modification, air is moving the easiest way. Around the top, pasing A, B, C and D, but not much air is going under the bord to the CPu or the chips on the HD. Also air is flowing easily around G and E with the same result. There are no parts at A ,B ,C ,E or F that need the major part of the cooling air while CPU and HD board it "starved". The Mod makes the most of what little air the fan has to offer. But off cause.. you can also do other things that will improve cooling even more. When I find the probe for my multimeter I'll have a look for you. A while ago I took temp readings of a disk in it, prior to installing the plate, and got 45ºC. It's a different disk in there now, so I cannot be sure what to expect. Hopefully a little less due to improved heat dissipation. Could anyone try taking temp reading with the unit as normal, and then turned upside-down ? Since I am running mine upside down it feels cooler, but I have no measurement of this. best way to cool down you N1200 is to cut a hole for a 120mm fan inside the housing (on the side of the Hard drive) and take a NOCTUA fan (12db by 800 rpm) super quiet. Fix the fan to the housing with the rubber holders and have fun. No noise and super cool.